Nina Kaptsova and Denis Savin in the Tango from the ballet The Golden Age. Music by Dmitri Shostakovich, choreography by Yury Grigorovich. Seen in frames of “Ivan Vasiliev 10 Years on the Stage” Gala Concert. Shot in 16.1.2017 in the Mikhailovsky Theatre, St Petersburg, Russia. Nina Kaptsova (Rus. Нина Капцова) is Prima Ballerina with the Bolshoi Theatre ballet company. She was born in 1978 in Rostov-on-Don, Russia, studied at the Moscow Choreographic College (today the Academy), in the class of Sophia Golovkina (Людмила Коленченко amd Софья Головкина). Upon graduating in 1996 she joined the Bolshoi Ballet Company. For a long time her coach at the Bolshoi was Marina Kondratieva. Now she rehearses under Nina Semizorova. 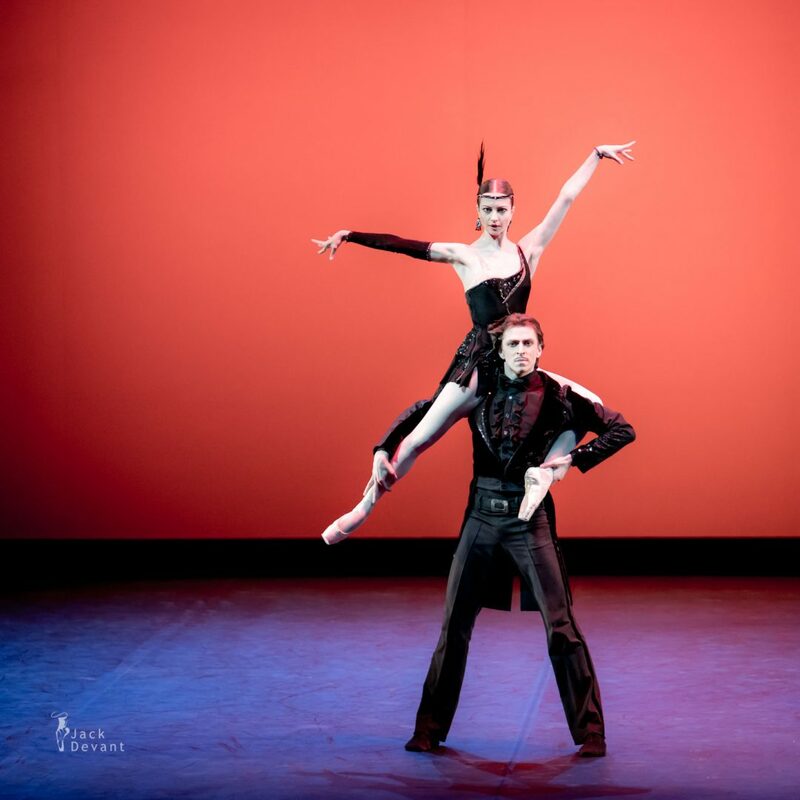 The Golden Age ballet exists only on the Bolshoi Theatre stage — no other ballet company performs it. Composed by Shostakovich when he was 24, the ballet did not win the hearts of the ballet fans at first. It was first staged by the Kirov Theatre in the 1930s, but was not a success and was withdrawn from the repertoire. The Bolshoi staged the ballet in 1982, choreographed by Yuri Grigorovich and with Simon Virsaladze as art director and Yuri Simonov as the conductor. The story features the decline of the NEP [New Economic Policy] in the 1920s. A conflict between the nouveau riche and criminal elements, on the one side, and the working young people who are creating a new life, on the other, breaks out at the fashionable Golden Age restaurant in a seaside town. The Bolshoi breathed new life into the ballet in 2006 when Yuri Grigorovich suggested a new version of his choreography. Original sketches by Simon Virsaladze were used to make the new scenery. The new stage version differs from the previous two, conceptually. The new Golden Age was produced in the 21st century when the burden of the communist ideology had been overcome. The key idea of the ballet was to show struggle in the name of love for a young girl. It is also to glorify a man whose music has created yet another ‘golden’ age of Russian musical history.